These beautiful patron saint, protector, pope and namesake jewelry comes in different sizes and can be personalized for that special someone. Each Christian religious medal is made in the USA and comes in a deluxe gift box. 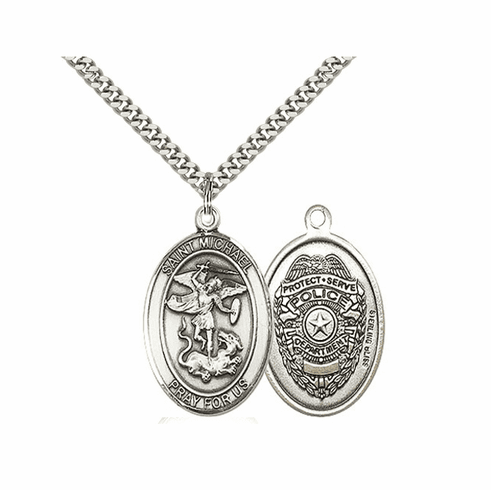 This patron saint medals are available in Sterling Silver, Pewter, Silver-filled, 14kt Gold-Filled or 14kt Gold. These medals make wonderful gifts for Communion, Confirmation, birthdays, graduations, and many other special occasions. Chain Options for Bliss Medals and Jewelry. Saint Michael the Archangel is a Patron Saint for Battle, EMTs, Germany, Grocers, Marines, Paratroopers, Peril at Sea, Police Officers, Radiologists, Sailors, Seafarers, Temptation. St Michael the Archangel memorial feast day September 29th.